This authentic Spicy Thai Chicken Curry involves making your own spicy curry paste. Make curry paste several hours before cooking to allow flavours to settle and intensify. Blend all curry paste ingredients until smooth. Let sit for several hours if possible. Heat 1 tbsp coconut oil in a pan and add curry paste. Cook for 5 minutes to allow flavours to intensify but be careful not to let the paste burn. Add coconut cream and simmer for a further 5 - 10 minutes. Remove from heat. In a large pan, heat remaining 1 tbsp coconut oil. Add chicken and brown on both sides. Put chicken and curry paste mixture in the slow cooker with coconut milk. Set heat on high for 2 hours. Turn the heat to low for another 2 - 3 hours. Add vegetables shortly before serving. 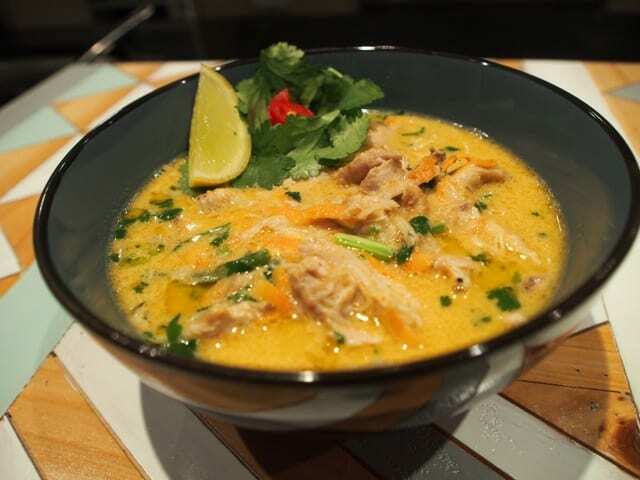 Serve this Spicy Thai Chicken Curry with fresh coriander.